I remember reading , and thoroughly enjoying, Lloyd Jones novel, ‘Mr Vogel’ and making the mental note that ‘I must read more of this man’s work’..but then, somehow, the opportunity has not arisen (or I have not made it happen). 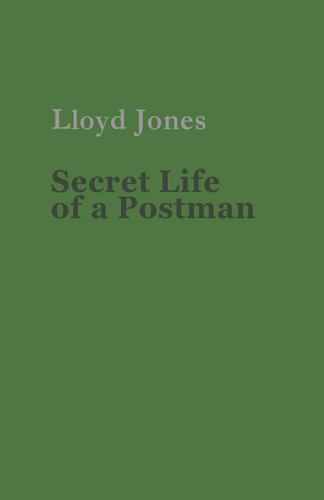 Just lately I was gifted a copy of Mr Jones’ new collection of poetry – ‘The Secret Life of a Postman’, and what a fine present this has turned out to be. The range and dimensions of these poems is, simply, quite staggering ; poems of love such as ‘A brief history of love’ paint a vivid picture in relatively few words, whilst the title poem is both lyrical and enigmatic. Some are curiosity writ large , ‘Guidance notes for people wishing to design a golf course water feature’ being but one prime example. There are poems that reflect upon Wales and Welshness – for me, ‘Sacrament’ being a beautifully written and constructed poem that captures so much of that very special essence. ‘Poet in the kitchen’ gives a tantalising glimpse of the writer at work, and a good number of the poems here are intensely, yet not intrusively, personal in their tone. The writing is both of and in the moment – as well as some of the lines and subjects being steeped in history and classical reference. It is very difficult to pull out favourites from this collection but, as the time of writing, I particularly want to commend ‘Aleppo’ and ‘The service’ ; I guess because, as is the case with poetry, music, novels and art the world over, something particular, specific and uniquely subjective makes me (you) reach out and embrace a verse, an image…tugs at your heartstrings and stays in your mind. I am convinced that there will be poems for all herein that will leave an indelible mark and bring you back to this excellent, enjoyable and, on occasion, testing anthology. A great achievement and a writer who deserves to be celebrated well beyond the magical borders of Wales. Thanks for this pointer, Marc. Sounds interesting – & not someone I’ve come across.